(St. Louis, MO) July 18, 2016. Anchor Packaging, Inc. announces the latest addition to the successful Incredi-Bowls® line of microwavable bowls and lids. The new, round 7.25” polypropylene (PP) bowls are designed to enhance the operator’s bottom line and are the perfect choice for a large individual serving or a family-size portion. Available in 20, 24, 32 and 40oz depths, the bowls share a common, polypropylene, vented lid. This new size joins the current 5”, 6”, and 8.5” bowls ranging from 5oz to 48oz for a total offering of 16 bowls in four footprints. Current trends continue toward smaller portions and healthier options. The consumer is looking for choices and not always willing to give up their favorite foods. This “new look of large” bowl size is the perfect answer. Not only is the smaller footprint more cost effective than larger diameters, these new microwavable bowls are made with a natural mineral additive, reducing the use of petroleum-based resin by 40%. The use of less PP resin allows Anchor to pass on the savings to their customers as a more sustainable option. One lid to fit four bowls eliminates confusion, saves space in the prep area and reduces inventory storage costs. The attractive black bowls provide a table-ready presentation in a durable, cut-resistant material. The leak-resistant closure eliminates messy spills. The vented lid includes integral Clear Guard™ anti-fog technology to prevent condensation or “fogging” of the lid. This maximizes hot-case merchandising opportunities for retailers and eliminates takeout order errors for foodservice operators, while keeping hot foods looking fresh and appealing. 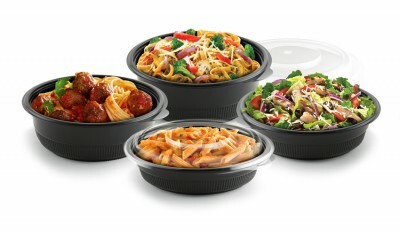 The four bowls and lid will withstand temperatures to 230°F in warming units, under heat lamps, or in the microwave. No need to re-plate chilled, prepared foods, when reheated in the microwave. In addition to hot cases, the Incredi-Bowls and lids can be used in refrigerated or ambient displays. All are dishwasher safe providing consumer-convenient reusability and are recyclable curbside. Anchor Packaging’s products include affordable, upscale to-go packaging to merchandising prepared, ready-to-heat meals in supermarkets, and for takeout meals offered by restaurants. Anchor’s unique products are found in most foodservice operations and include stock and custom rigid packaging, as well as a broad line of cling film wraps.